JUSTIN Timberlake performed an energetic, hit-filled halftime show at today's Super Bowl - but it was his tribute to late music icon Prince that left fans divided. Rumours had surfaced over the weekend that Timberlake was planning to perform alongside a hologram of the singer, who died almost two years ago. Those reports prompted emotional protests from those close to Prince including his sister and his musical collaborator Sheila E, who said she personally called Timberlake to confirm he would not be using a hologram. Prince himself had vowed in an interview before his death that his likeness would never be used in a hologram after his passing, describing it as "the most demonic thing imaginable." Mercifully, there was also no sign of the hologram - but Timberlake went with the next best thing, 'duetting' with Prince on the classic hit I Would Die 4 U as a giant projection of the singer performing live appeared on an enormous sheet hung in the middle of the stadium. A wide shot outside the stadium showed nearby buildings bathed in a purple glow as Prince's iconic symbol lit up the ground around the venue. So Justin played terrible piano and sang some poor vocals next to projected imagery of Prince over "I Would Die 4 U". Not your song. Better than anything you've ever written in your whole career. Not your place to do this. Like I said, culture vulture. 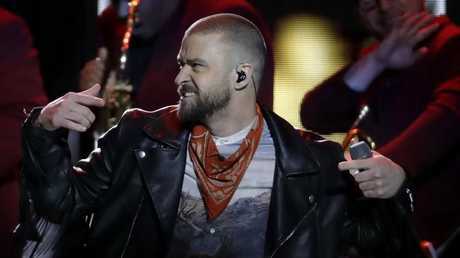 Timberlake certainly crammed a lot into his 12-minute performance, opening with current single Filthy, the lead single from his new album, in a makeshift club setting underneath the Super Bowl stadium. Rock Your Body followed, Timberlake and dancers strutting on a purpose-built catwalk across the audience and onto the field. Hits including Sexyback, My Love and Cry Me A River came next, before Timberlake's own Prince-aping ballad The End Of Time morphed into the aforementioned Prince tribute. Next it was stately ballad Mirrors before ending with - what else - his ubiquitous Trolls theme song Can't Stop The Feeling. It was a hit-heavy performance from Timberlake whose newly-released fifth solo album Man of the Woods has copped a savaging from critics, with its several released in quick succession failing to set the charts alight. Earlier, music icon Janet Jackson flatly refuted rumours she would join Timberlake on stage during the performance for a 'do-over' of their infamous 2004 Super Bowl duet. "To put to rest any speculation or rumours as to whether I will be performing at the Super Bowl tomorrow; I will not," she tweeted yesterday.